Oscar® Winner Sandra Bullock and Oscar® Nominee Melissa McCarthy are a “dynamite duo” (George Pennacchio, KABC-TV) in this outrageously funny comedy from the director of Bridesmaids, Paul Feig. Uptight FBI Special Agent Sarah Ashburn (Bullock) and foul-mouthed Boston cop Shannon Mullins (McCarthy) couldn’t be more incompatible. But when they join forces to bring down a ruthless drug lord, they become the last thing anyone expected…buddies. I haven’t laughed so hard at a movie for a long time! The Heat is hilarious! USA Today says its “the funniest movie of the year” and I think they are right. Sandra Bullock and Melissa McCarthy are comedic perfection delivering humour throughout the entire film. If you love a funny movie, you need to watch The Heat. 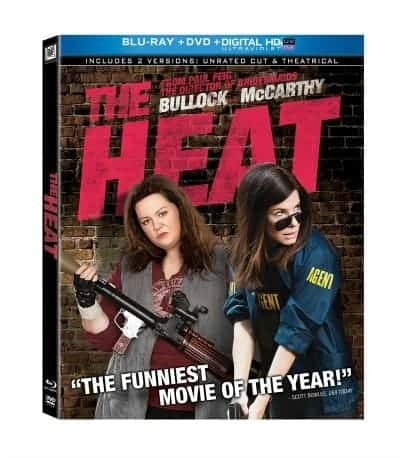 Sandra Bullock plays an uptight FBI agent, Sarah Ashburn, who is social outcast while Melissa McCarthy plays a volatile Boston police officer, Shannon Mullins, who has an unorthodox way of getting the job done. The two of them together make the perfect team. They are thrown working together on a case to track down a drug lord named Larkin and at first, Sarah Ashburn doesn’t want to have anything to do with Shannon Mullins. They are complete opposites and Sarah is horrified by the way Shannon conducts her investigations. She ends up not having a choice but to let Shannon in on her on investigation and that’s when the real fun begins. When they are going to interview someone for the case, Shannon mentions they are “The Heat” meaning to influence the person to get them to talk and give up the info they want. My favourite character was Shannon Mullins. I think she stole the entire show. She was so funny and both John and I were roaring with laughter. John even said it was the funniest movie he’s seen. That’s coming from a guy who watches A LOT of movies! One of my favourite scenes was at a night club when Sarah and Shannon went one night and planned to plant a bug in one of their suspect’s cell phone. How they accomplish that task still makes me giggle. Let’s just say there’s some spanx involved! I also loved the scene when Sarah and Shannon are drinking at a bar and Sarah ends up drinking a tad too much. She has completely come out of her shell and is wild! It was fun to watch. It also had a few heartwarming moments and after it was over, I felt so relaxed and had a big smile on my face. It’s worth watching or buying as a holiday gift for a movie lover in your life. I really want to see this! It looks so funny! I want to see this movie, I remember when it came out and wanting to see it during the theatre run. Both actress are great and Melissa McCarthy was hilarious in Identity Thief. I really want to see this movie, I could use a good laugh! Very glad to read this review. I just bought the movie on a deal. I want to really like it, and I like the actresses. I had heard some negative reviews though and wasn’t sure. Now, I’m glad that I went ahead and got it. We can always use a good, funny movie.